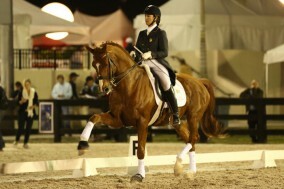 Catherine Haddad Staller and Mane Stream Hotmail at the CDI-W in Wellington, Fla. Photo by Anna Sylvan Jaffe. Grand Prix horses are made, not born. And my horse Mane Stream Hotmail is no exception. Pieces of this story you already know. Mane Stream Hotmail came to me in late spring of 2012. He was 10 years old, a bit stiff and resistant in places, but not without charm. He was a third level horse who was scoring 62 percent in Denmark at national shows on a good day. One day in June of 2012—only a few months after becoming my horse and countless repetitions of leg yield in canter to get him on my parallel aids—Hotmail began to truly understand the flying changes. Fours, threes and twos became easy communication for us. Within weeks, I was able to start work on one-tempis. Piaffe was still only a cute trick that he did, and passage was only a thought waiting to be born. Pirouettes looked possible. By fall of 2012, he showed a proclivity for the whole range of movements in the Grand Prix, and I was enjoying the work with him so much that I stopped asking myself if I could turn him into a Grand Prix horse and started asking myself, “How good of a Grand Prix horse? Could he go international?” Every day he began to answer my proverbial request to jump with, “How high”? I KNEW he would make it if he stayed happy and sound. I wanted him to become more interested in the conversation we had every day. I wanted him to step up to the plate and start leaning into the work. So I made that goal No. 1 as I continued to train him. At which point I really started planning how to get from here to there. We needed routine in our work. Stay focused, keep going, don’t sweat the mistakes, develop an attitude of “let’s turn and do this….” Hotmail had to enjoy the work. We are on the same page and focused on the same things. And our plane would be taking off for the USA on Oct. 31, 2012. We moved home. Now it was time for me to produce a Grand Prix horse. I would like to say that it was all easy-peasy from there, and the first few months in Florida did go exceptionally well. Hotmail won four Intermediare II tests in December and January. He was green, he was guessing, but he was guessing right, and our best tests were winning with over 73 percent in the national classes. I thought I might have a horse for Normandy in 2014 if all went as planned. Of course the best-laid plans go awry. Long story made short, I sat on the sidelines for five months in 2013 due to various injuries that I sustained. Hotmail cruised along with me during my recovery and happily made his gaits a little smaller again to accommodate my lost mojo. But as I regained strength and timing, I decided to take a huge leap of faith in my green, inexperienced horse and enter him in the Devon CDI-W at the end of September 2013. Hotmail placed second in the Grand Prix Special with over 70 percent. Then I tore the meniscus in my knee and had to stay out of the saddle for another six weeks. It’s really only been since our return to Florida in November that I am able to train him consistently again. So while I ended up starting the Florida season with an unseasoned horse, I can tell you Rita that I am over the top with our results. Mane Stream Hotmail has gone from a completely unknown athlete to one that has left a very clear business card in the arena at the Global Dressage Festival in Wellington, Fla. I love this horse. I can RIDE him in the test under all circumstances. It doesn’t matter if the atmosphere is quiet on Grand Prix day and Hotmail is a little sleepy—I can ask him to shake off the lethargy. It does not matter if the temperature is 90 degrees or 45 degrees—he can do both. It does not matter if he is totally wound up because the lights are on, the music is loud and the crowd is electric. In fact, Hotmail was trotting right out of the tack as he entered the stadium for our first freestyle. But he stayed with me, and for all the excitement that threatened to bubble over in him, HE LET ME RIDE. Rita, I cannot tell you how necessary it is to have a horse that lets you ride in the Grand Prix. No hanging back, no hoping the stars are lined up right. Just good riding and great partnership. When you have a horse that lets you ride, you can be fierce. And that will bring you home a basketful of points every time. Hotmail is the best horse I have developed to Grand Prix level so far. He has incredible athletic ability and balance. He can elevate and express himself like no other horse I have ridden. His passage is amazing. And there is nothing in the Grand Prix that is difficult for him. He simply dances through it. If ask him to be cool, he calms down. If I ask him to step it up, he gives it all. What more can a rider ask for? I was asked in a recent magazine article, “What is the most important skill you developed during your 20 years in Germany?” This is it, Rita. The making of happy, rideable Grand Prix horses. And Hotmail is the best example of my work to date. I love this horse. I love this job! Forgive him the impatient kick in the first halt, please! He wanted to GO, and the music could not start soon enough for him! As a trainer I strive to teach my horses one thing above all others: Love the sport. I want my horses to view the centerline as their big chance to move and express themselves, to PERFORM with expression and power. That is what true dressage is all about. And Hotmail is made for true dressage. I’m Catherine Haddad Staller, and I’m saying it like it is from Wellington, Fla.
Training Tip of the Day: Be fierce. That’s how you get from here to there.